Wellness travel has continually appeared on the spa trend reports for the last few years, and for good reason. Yesterday, Spafinder Wellness 365 released part one of its eighth annual State of Wellness Travel Report, which revealed record-high expectations for 2015. Eighty-six percent of survey respondents—North American and European travel agents—expect growth in the wellness travel sector, a global market estimated at $494 billion by the Global Wellness Institute. 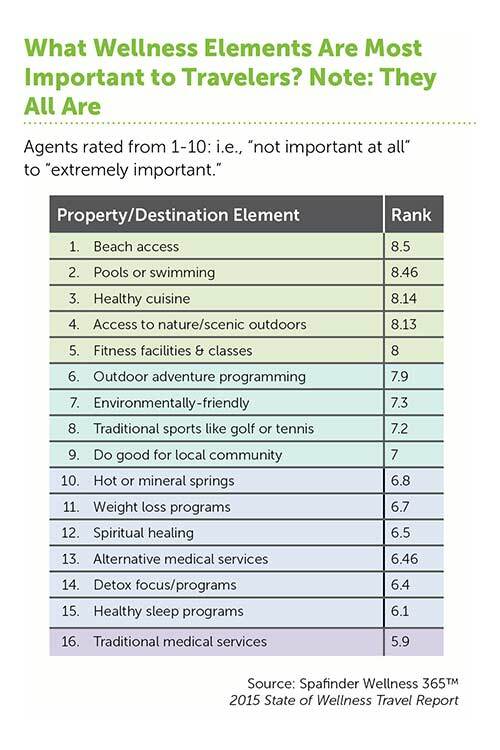 Awareness of the wellness travel industry is high on everyone's radar: Between 71–80% of agents report significant annual growth in awareness with consumers, travel agents, the tourism industry and hospitality industry. Fifty-two percent of travel agents report that 20% or less of the wellness-focused travel they book is primarily spa-focused. Only 19% say that more than half of the wellness travel booked is primarily focused on spa experiences. Consumers are willing to pay a premium price for access to high quality wellness travel, and healthy products and services while traveling. A high numer of travel agents—79%– reported that demand for healthier business meetings is on the rise. For the first time, Asia saw the biggest growth in wellness travel bookings in the last year. Within Asia, Thailand ranked first for wellness travel, followed by Bali/Indonesia and India. Costa Rica led in the Americas, followed by the Caribbean Islands, Nicaragua and Brazil. Europe, Hungary, Croatia, Turkey, Italy and Greece were standouts in Europe. And across the Middle East/Africa, the leaders were Israel, Dubai and Morocco. Share with us how your spa is tapping into the wellness travel industry at our www.facebook.com/SkinInc or on Twitter @SkinIncMagazine.